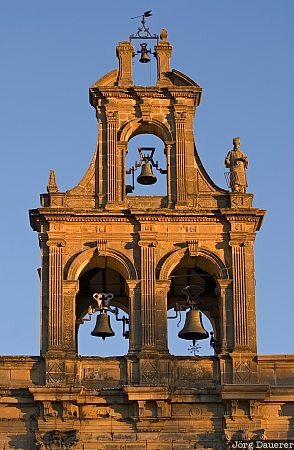 One of the two bell towers of the church Santa Maria de los Reales Alcazares in the renaissance city Ubeda illuminated by warm evening light. Ubeda is in the province of Jaén, Andalusia in southern Spain. This photo was taken in the evening of a sunny day in April of 2008. This photo was taken with a digital camera.